Enjoy the Film, 6431 S. Cottage Grove Ave. Eight years ago, before South Side Projections really got going, our founder Mike Phillips and local film collector Chip Hess presented a monthly series of schlock-movie double-features in the basement of a church in Wicker Park. It was called Shock Theater from the Cinema Dementia Collection (Chip’s name for his extensive collection of prints). It was great fun, and we learned a lot in that B-movie basement, including that you need to be very clear about the terms of your deal with a venue and that low budget doesn’t always mean low quality. But sometimes it does; sometimes it’s about sharing a laugh at a bad movie with a bunch of like-minded people while being open to the idea that there is value to be found even in the most nutty of films. 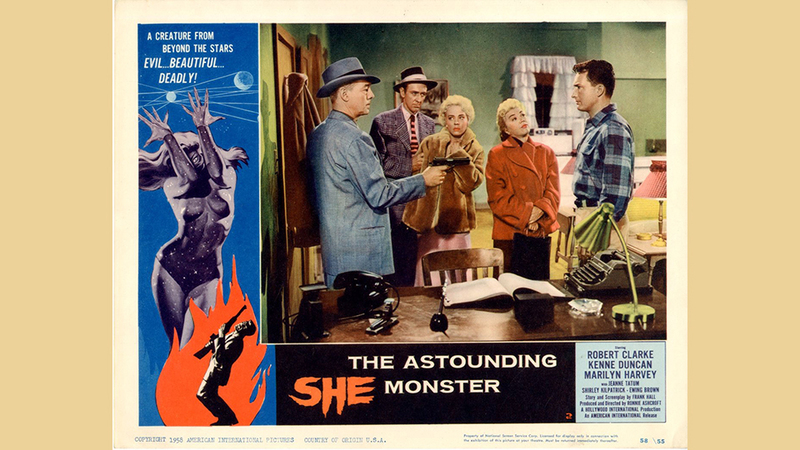 We’re bringing the series back for one night with Ronnie Ashcroft’s The Astounding She-Monster (1957, 62 min., 16mm from the Cinema Dementia Collection), about a gang of kidnappers who run up against a beautiful, lethal alien whose very touch can kill. Chaos, as it so often does, ensues. Before the show, enjoy some 45rpm entertainment provided by DJ Bryce Prewitt of WHPK’s Witch Hunt show.